Today I pulled out all the Christmas books and laid them in a pile so that we can read them many many times over the next month. I also found my Christmas music. We are starting to get in the mood around here! We have a new book to add to our pile ~ Ride the Holiday Train – a large Board Book with Flaps! Buddy and his friends are super excited. Their favorite holiday is coming—the Winter Solstice! Kids travel on the holiday train to the North Pole where the Pteranodon family has the chance to build snow dinosaurs, play a prehistoric game of ice hockey, and meet some new friends. Secondary learning activities which reinforce learning concepts are included, and over 45 flaps hide fun surprises that kids will want to find again and again! P’Diddy loooooves flaps! There are many on each page. Super cute! Also this season is the Dinosaurs A to Z DVD ~ featuring a bonus holiday episode! Travel on the Dinosaur Train with Buddy, Mom, and Tiny to gather all the dinosaurs in the “Dinosaurs A to Z'” song for a picnic at Troodon Town! Join the Pteranodon family as they reunite with some dinosaurs they’ve met before, and are introduced to new species, and learn about the classification of all 26 dinosaurs on the train. Bonus Holiday Episode: Solstice Time – While visiting the North Pole, the Conductor suggests that the family stop off at Aurora Borealis Station on an enormous frozen lake to see the Aurora Borealis, where the Northern Troodons celebrate a “Festival of Lights.” While the kids wait for night to fall and view the Aurora Borealis, they work up an ice-skating show to entertain Mom and Dad. Everyone joins in to sing “Solstice Time is Here” and skate under the lights! We haven’t watched it yet because I am saving it for a present, but we have the Dinosaurs A to Z Padded Board Book which is great! Learning our letters with Dinosaurs like Shiny and Buddy making it all the more FuN! 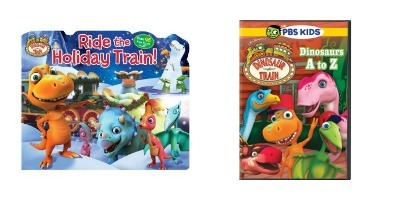 Don’t forget about Dinosaur Train Pjs, Slippers, the book A Holiday with Buddy, and NEW episodes in December. Take a peek at my blog post HERE from a couple of weeks ago about all of that! I received this products for review and all opinions are my own. This giveaway will end on December 6, 2012 at midnight EST. Winners will be drawn via rafflecopter. Once a winner is drawn I will contact them and they will have 48 hours to reply before I draw a new winner. Giveaway is open to anyone in the US and you must be 18 years of age or older. Giveaway not affiliated with Facebook & I release them of liability. Winner will be posted in the rafflecopter widget. Yes! We put our Christmas lights out on the house yesterday morning! It looks great! We havent started decorating yet. We should have hung the outside lights yesterday....because the temperature dropped over night and it's so cold now! Thanks! no; i think i will do it next weekend! We got out everything but need to put it all up still! Tonight is the night!! I am going to start decorating for Christmas tomorrow - can't wait! No holiday items yet... I did order my son a stocking. We set up the tree. We usually make or buy gifts throughout the year, so besides wrapping a few items that have come out of storage, we really just plan to relax the rest of the season, spending time with our children making fun crafts and baking some treats. I have already put up the Christmas tree and the inside decorations, but not the outer decorations yet! I have started getting things out for Christmas because I love celebrating Christ Birthday! So I start as early as possible! we will start getting out our holiday stuff on monday!!! We don't have Christmas decor out yet, but we did get our family Santa picture today. I haven't quite gotten our decorations out yet...but I will in the next couple of days. My goal is to have everything ready by December 1st because we've got a baby on the way! Got it out and its almost all put up! Not yet ...but this is the week! A. 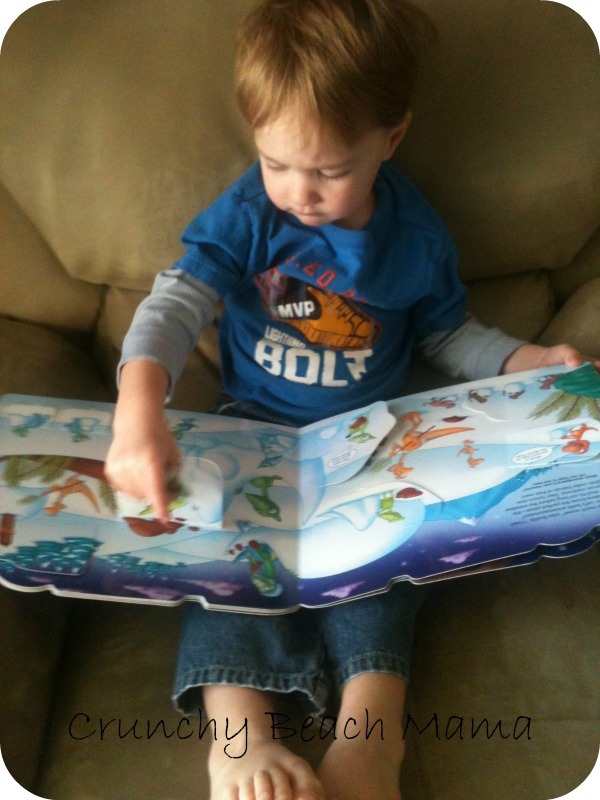 Loves lift the flap books! that's the plan for this week! We started to setup for Christmas today. we have played at Santa-I had to pull the sleigh of course! This household loves Buddy! We celebrated Christmas at Thanksgiving due to a deployment. We just started decorating and shopping today. Thanks for the great giveaway and happy holidays! I almost done holiday shopping, I just need to get my stocking stuffers! i just started shopping this week! Our Christmas stuff is up and we are ready for Sanat! Yes we're putting up the tree tomorrow actually, just got it out of storage today! Christmas shopping is almost done, too. I have most of mygift shopping done! Yes, we took it out the day before Thanksgiving!! Nope, haven't gotten out a thing! I have gotten out my Christmas stuff after Thanksgiving Day. We have all of our holiday stuff out except for tree decor since we didnt get a tree yet. Lights are up outside the house but of course we've blown some fuses so my husband needs to get up there and fix them, lots to decorate inside! Planning on getting it out today! Yep, my husband decorated while I took a nap on Thanksgiving. Trees is up, lights-no decorations yet. Lights & decorations up on front of house. We started decorating with our lights, but haven't brought the rest of the decor out quite yet. Tree is up and we have a few things outside.I want to get a few more inside decorations but will see how finances go. I have decorated inside, but not outside yet! All the decorations are up, just need to knock out that gift shopping. I am pretty much done holiday shopping! This would make a wonderful Christmas surprise for my youngest nephew. He loves Buddy. Thank you for the chance to win. Happy holidays! My son would love this. as for your question. House is completed decorated and I'm almost done shopping! I am done shopping for my 6 year old son but not my 4 year old daughter. We celebrate bth Christmas and Hanukkah. I'm done with the Hanukkah shopping, but haven't started on Christmas yet. I have not started getting my holiday stuff out, and I probably won't. I'm always working or just plain tired. Yep, house is all decorated for Christmas!! I have a couple bags of decorations out, but that's it! I have nothing hung up yet.. I procrastinate, it's sad. I decorated early this year before Thanksgiving because my brother and his daughter came to visit. Yes I have started decorating. We are behind on putting out the holiday stuff but it will happen this weekend! PS. All my son wants for Christmas is Dinosaur Train!! The outside of my house is decorated but not the inside. All our decorating is done, we even have 2 Chrsitmas trees up this year! I've got what I have won under the tree but no shopping yet. Yes, we do have our little tree up. I've just barely started my holiday shopping!! I need to find a babysitter and get out shopping lol! Not yet ... I need to! Well, I got the box out, but nothing's put up or out at all, lol. I have not done anything for the holidays yet. I have decorated all that I am going to this year. No I just can't get into the spirit we are struggling financially like so many others and it is just hard to get into it. I suppose I will have to decorate soon even though my kids are grown I know they want to have Christmas. I have started, but this weekend is the big decorating! We have our tree up, we just need to trim a couple branches off the bottom and we'll be decorating it this weekend and getting the other decorations out. I think I'm going to let the boys go pick out a yard decoration because they love them so much. If I win they are going to LOVE this! Thank you for the sweep.